As consumer advocates push for expanded tenant’s rights laws, landlords are wondering where their protections have gone. As a recent op-ed column in The New York Times reveals, the landlord presiding over an entirely legal eviction can end up vulnerable to a host of potentially dangerous outcomes from disgruntled tenants. And for some property owners, its better to leave properties standing vacant than deal with those risks. According to San Francisco landlord Scott James’ guest piece in the New York Times, a nightmarish experience with a tenant led him to the decision never to rent the property out again – a move that makes sense, given San Francisco’s notoriously strict tenant rights laws and tight housing market, where vacant buildings sell for more than occupied ones. But dealing with tenant problems can be difficult in an environment where consumers’ rights groups and legal watchdogs cast landlords as the villain. It seems simple on paper: tenant and landlord sign a rental agreement, everybody knows what they have to do to keep things running smoothly and the arrangement holds until these ideal renters move out. But, as we’ve noted in previous posts on landlord/tenant issues, that doesn’t always happen. Tenants fail to pay rent, destroy property, endanger others and file lawsuits. Tenant advocacy groups rightly point out that renters especially in markets where rentals outnumber owners, need protections from unscrupulous property owners, but fair-minded owners feel that there’s hardly any advocacy for them. Each state has its own landlord tenant laws, part of a network of property related laws that include municipal codes and taxes. 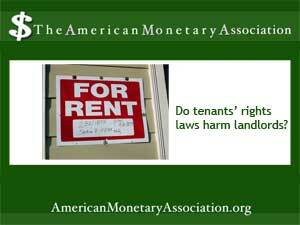 Because it appears that landlords hold the cards, protecting tenants has been the focus of many advocacy movements around the country.But frustrated landlords find that too often the only option to solve a situation is to evict the tenant. Although this is a process entirely protected by law as long as the proper procedures are followed, the landlord often ends up playing the role of the villain in the piece. Eviction can be a long and potentially expensive undertaking. Notices must be served, the tenant has the chance to respond, and the process can take months. If the landlord triumphs and the tenant can be evicted, actually getting that done becomes another process entirely. And because evictions and threats of eviction add fuel to the fire of the original problem, property owners may end up fearing for their safety and that of others on the property, Angry tenants faced with eviction have trashed rental homes, set them on fire and shot out windows in a final act of defiance that puts everybody at risk. With considerations like these, its no wonder that many investors turn over the day to day handling of issues like these to outside property managers. But even so, evictions and other kinds of tenant management have the potential for inflicting damage to the property and the people around it. James. Scott. “King of My Castle? Yeah, Right.” Opinion Pages. The New York Times. Online, 6 Jun 2013.